Playtime is an important part of the day. It's late afternoon in the Tender Sprouts orphanage at Puthukkudiyiruppu, in Tamil Tiger-controlled north-eastern Sri Lanka. A group of children hold hands as they form a large circle in the playground, swaying gently as they sing. These sessions are part of an effort to help these children forget that awful December day, when the giant tsunami wave swept through their orphanage located at the time on the coast. "It's a very important part of their day," says camp co-ordinator Ragini. "The main idea is to allow them to express their emotions while giving them hope." "Through singing, dancing and play acting we try to get them to be positive about their present situation, and look on the bright side." 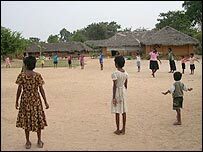 That may seem to be an impossible task for these children, many of whom were orphaned during the long years of civil war between the Tamil Tigers and the Sri Lankan government. And the recent upheaval has not helped. This is the third location the school has been moved to - the earlier one was a mental hospital in Kilinochchi, further inland. But despite the trauma, counsellors and teachers say the children have learnt to cope and are moving on. Krishantini is a bright-eyed 11-year-old, who is currently in grade six. Some classes are held outdoors for lack of room. 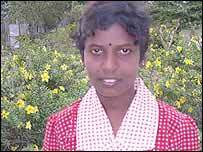 "I enjoy my classes, particularly Tamil - I love listening to stories," she says shyly. Her friends say she is also good at storytelling and often spends nights relating them to other children. But she refuses to talk about the tsunami except to say she is scared of the sea. Romesh is one of several Jaffna University drama students who have been roped in to help the children get over their trauma through role-play. "Our main effort now is to get them to focus on normal, everyday things. "Some of them still have very dark memories - we don't repress them but we don't always want them to focus on them either," he says. In the immediate aftermath of the tsunami, aid workers and the church began the task of helping children in the tsunami-affected areas deal with their tragedy. "Irish nurses and priests who had come here would encourage the children to sing, dance and draw," says Sister Hilda, principal of Mullaitivu school. The children are preparing for their exams. Since then, the education department of the provincial government has picked up the mantle of helping the healing process. "The main idea is to allow them to express their emotions while giving them hope," adds Sister Hilda. But there is also an attempt to bring a sense of normality back to their lives. In the Mullaitivu school, children pour over their books as they prepare for their annual examinations. Classes are held in large tents, provided by Unicef, which house several classes side by side. "When someone asks me about my sisters, I say they are staying with family somewhere else." Lectures in mathematics, geography and science take place simultaneously. Some of the classes spill outdoors, with children grouped around a teacher under the shade of a tree. "We make do with what we have," says Dayanand, who teaches science and mathematics. "They are very keen to learn and to make up for lost time." But despite the reassuring routine of school and playtime romps, it is not easy to forget. "Many of the children still cry at night or wake up with bad dreams," says Tender Sprout camp co-ordinator Ragini. For some like 14-year-old Shantini, who lost both her sisters, the memories have been pushed deep down. "When someone asks me about my sisters, I say they are staying with family somewhere else," she says. "I don't want them to know what really happened."